Former Minister of Aviation, Femi Fani-Kayode has said that the presidential candidate of the Peoples Democratic Party, Atiku Abubakar will defeat President Muhammadu Buhari of the All Progressives Congress APC in the forthcoming presidential election. He warned that if Buhari insists on rigging the election all hell will break loose. 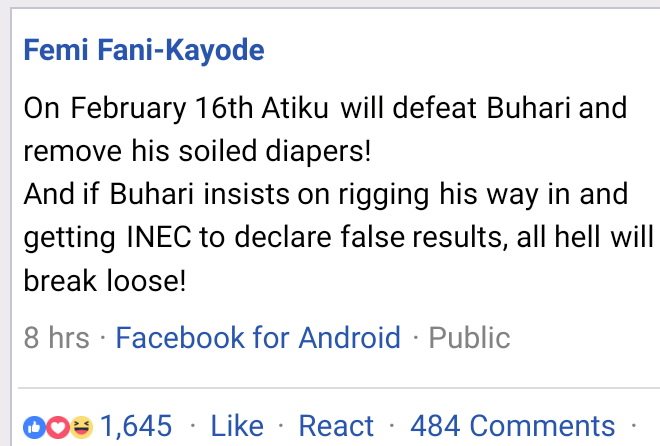 His words, "On February 16th Atiku will defeat Buhari and remove his soiled diapers! "And if Buhari insists on rigging his way in and getting INEC to declare false results, all hell will break loose!